The above picture of the relationship between commonsense and social structures complicates this further. Commonsense is not the sort of thing that can be discursively elaborated, being composed of dispositions that are open-ended, differential responses to each other and to contexts, emotions, and embodied actions. Its polyvocality deflects criticism, which has led many to foreground the situated and specific “here and now” as an unanalyzable foundation of practices, as in Rorty’s ethnocentrism.10 But, the imbrication of power and commonsense renders this problematically conservative where “meanings are so embedded that representational and institutionalized power is invisible”.11 Such “hegemony colonizes consciousness”,12 so foreclosing our ability to reconstruct, or renegotiate, commonsense, particularly insofar as hegemony is understood to embed a specific constellation of power across the social field. But, how, then, could it be possible to begin “crafting counter-hegemonic knowledge that fosters changed consciousness”,13 when agents find themselves to be embedded in, and to further embed, forms of power that disenable them from exactly that? Neither discursive explicitation and reasoning, nor understanding commonsense as an unanalyzable set of practices, would seem to do the job. So, what sort of capacities would be required to craft counter-hegemonic strategies? 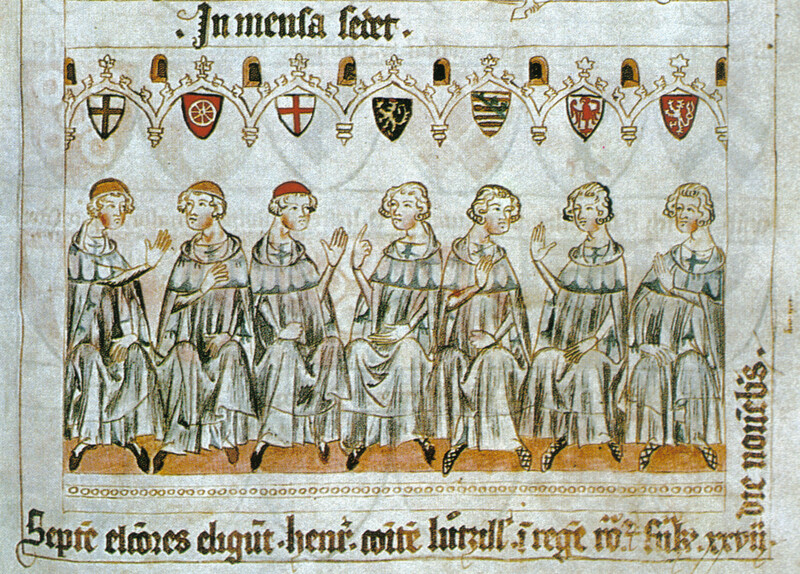 Prince-electors in deliberation, Codex Balduineum, Mid-1300s. Let us consider how norms are instituted to better understand the construction of commonsense. Perhaps the best-known account of commonsense is in Wittgenstein’s notion of forms of life, which is often used as a means of considering practices of living together, our ethical commitments to each other, and the basis of our language games.14 According to Wittgenstein, in order for agreement in opinions (his terminology), we first require that there exists a “common form of life” in which we are “mutually attuned” with each other—which, as Mouffe points out, does not require procedural rules.15 Such forms of life have often been understood as an unanalyzable set of practices, which absolves from responsibility any judgments made on that basis.16 Others, however, have used the notion to demonstrate that regulism (the idea that norms can be grounded in explicit rules) yields to a vicious regress. Famously, Wittgenstein argues that the regress shows “that there is a way of grasping a rule which is not an interpretation, but which is exhibited in what we call ‘obeying the rule’ and ‘going against it’ in actual cases”.17 More recently, Brandom interprets Wittgenstein’s conclusion as motivating a pragmatic approach to rules: “[T]here is a need for a pragmatist conception of norms—a notion of primitive correctnesses of performance implicit in practice that precede and are presupposed by their explicit formulation in rules and principles”.18 Brandom’s solution to the regress of explicit rules is to look for rules that are implicit in our practices. For Brandom, norms of reasoning are “instituted” through social practices in which certain rules of reasoning that are implicit in those practices may be made explicit through their public expression in language games. Brandom argues not just against regulism, but also against regularism, which in this case would say that implicit rules could simply be read-off from regularities in practice. One problem with regularism is that we could force a finite set of practices to conform to several distinct rules, and for any “deviant” form of practice, it can be made to cohere with some rule or other. As such, any attempt to distinguish between correct and incorrect practices would seem to quickly break down, and the idea that we could read off a set of rules from practice would seem to end-up with our writing-away all those occasions in which we do not reason according to the norms that are supposedly implicit in our behavior. Brandom attempts to deal with this sort of problem by arguing that social norms can be identified by the way we sanction each other in ordinary linguistic practice, by judging each other’s utterances to be correct or incorrect. But, as Brandom notes, sanctioning cannot itself be a matter of regularity, or disposition, since that would simply reintroduce the problem of regularist gerrymandering at the level of sanctions, rather than the level of first-order practices. As such, according to Brandom, sanctions must themselves be normative, so we have “norms all the way down”.19 That is, Brandom effectively postulates the existence of proprieties of practice as normatively primitive, and argues that these determine our abilities to evaluate and sanction each other. Thus, whether or not this avoids the problems of regulism and regularism, is now reliant upon giving a decent account of this activity of sanctioning that is thoroughly intersubjective. So, Brandom fails to provide an account of intersubjective norms, and, in the process illuminates the inherent conservatism of social norms insofar as their construction is obfuscated. There is reason to think, however, that the coordination of linguistic interaction exists as a kind of shared understanding between agents without requiring objective scaffolding, or implicit rules.24 In distinction with dominant analytical philosophy of language, linguistic interaction may be understood in terms of non-intentional coordination and underlying cooperative activities. For example, Gregoromichelaki and Kempson provide evidence and argument to the effect that communication does not require the manipulation of propositional intentions, since agents often express “incomplete” thoughts without planning or aim regarding what they intend to say, “expecting feedback to fully ground the significance of their utterance, to fully specify their intentions”.25 Moreover, this kind of coordination between agents is often sub-personal, involving mechanisms by which agents synchronize together prior to the level of communicative intention. In making utterances in interaction, we may “start off without fixed intentions, contribute without completing any fixed propositional content, and rely on others to complete the initiated structure, and so on”.26 As such, it is argued that meaning should be understood by means of intentionally underspecified—yet incrementally goal-directed—dialogue. 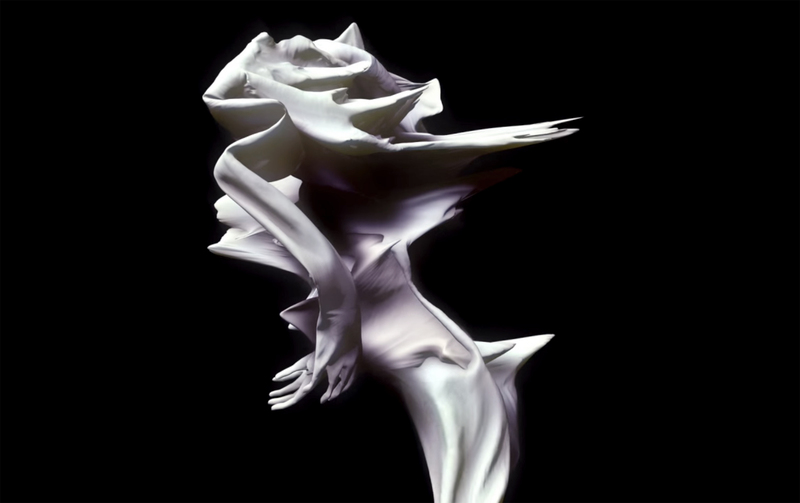 Screenshot of FKA twigs’s “How’s That” (2013), video by Jesse Kanda. All rights reserved. Norms, therefore, emerge from, yet also exert significant pressure on, social and material structures. The conservative nature of normative practice is endemic to Brandom’s approach. Here, however, whilst our ability to diverge from accepted usage comes with a cost, the process of explicitly reasoning and considering our norms and the way in which they are sculpted is made possible by the fact that there are no precise normative rules (implicit or explicit) to which we may appeal to adjudicate those activities in the first place. Furthermore, whilst Brandom’s account relies upon communal stability and the normative constraints of group membership in which a system of norms becomes visible to that community, this approach suggests that it is not possible for a group to become explicitly aware of a system of norms that is being reinforced across that community. Indeed, by embedding the account in a radical intersubjectivity, we need not rely upon a notion of a stable “community,” preferring instead to think of relatively stable norms, across which there are multiple and intersecting relationships and interactions. As such, the “harmonious” nature of much linguistic interaction may be understood to be an effect of the sedimentation of norms through the sanctioning of linguistic practice, and, therefore, of the embedding of specific forms of structural power. In these settings, whilst it is certainly the case that there are relative points of equilibrium maintained through reinforcement and feedback through adjustment, calibration, and sanctioning (where required), even the activity of sanctioning would give rise to the possibility of resculpting local norms by explicitly reconstructing those norms in our interactions. This is because, unlike the effectively third-person standpoint of sanctioning practices required by Brandom, for us, the practice of sanctioning is “brought into the loop,” so the sanctioning agent is equally implicated in their own practice of sanctioning. In this way, rather than understand sanctioning as simply reinforcing equilibrium, we may rather think of sanctioning as making available normative-talk for the reconstruction of differential patterns of linguistic activity. Since these activities cannot be forestalled by a precise set of rules (implicit or explicit), the interactions always have potential to construct new forms of activity that begin to construct new norms of practice. But note that this is neither a matter of ideology critique, nor of making explicit, since reasons, here, are emergent from interactions, rather than constitutive of speech-acts in the sense understood by Brandom. That is, reasons should not be thought of as driving communication, but rather as “discursive constructs,” which allow for explicit deliberation, particularly when the coordination of underlying dialogue breaks down.39 So, interactions are the foundation through which reasons may be constructed a posteriori, since we cannot determine in advance of the interaction, either what counts as a reason, or the meaning of expressions involved. On this, radically interactional, approach, we think of the construction of reasons over the course of a linguistic interaction through the coordinated relationship between agents who are directly involved in that interaction. All reasons, in this sense, are “joint reasons” in that they are the result of a process of joint articulation that is not reducible to, nor derivable from, facts about the individuals involved in the interaction.40 Moreover, the norms structuring our reasoning together, and through which the meaning of terms is constructed, are always possibly modifiable, and indeed are constantly modified simply by the practices of interaction. The author wishes to thank Alex Williams and Inigo Wilkins for their insightful comments on a previous draft of this paper. P.H. Collins. Black Feminist Thought: Knowledge, Consciousness, and the Politics of Empowerment. Perspectives on Gender. Taylor & Francis, 2002. 284. Web. See the discussion of the construction of commonsense in the work of Gramsci in Alexander Williams. “Complexity & Hegemony: Technical Politics in an Age of Uncertainty” (thesis). London: University of East London, 2015. Web. William H. Sewell, Jr. “A Theory of Structure: Duality, Agency, and Transformation.” American Journal of Sociology (1992): 1-29. Print. For an account of social structure conducive to this discussion, see Dave Elder-Vass. The Causal Power of Social Structures: Emergence, Structure and Agency. Cambridge: Cambridge University Press, 2010. Print. See Iris Marion Young. Responsibility for Justice. Oxford: Oxford University Press, 2013. Print. The analysis of “internalization” captures this to some degree, though it suggests a “one-way” imposition of power and ideology, which the account here attempts to complexify. J. Elster. Deliberative Democracy (Cambridge Studies in the Theory of Democracy). Cambridge: Cambridge University Press, 1998. 5. Print. This is central to Habermas’ early work, e.g. Jürgen Habermas. The Theory of Communicative Action, Vol. 1: Reason and the Rationalization of Society. Trans. T. McCarthy. Beacon Press, 1984. Print. James Bohman. Public Deliberation: Pluralism, Complexity, and Democracy. MIT Press, 2000. Print. Tully makes a similar point in Public Philosophy in a New Key, Vol. 1. Cambridge: Cambridge University Press, 2008. Print. For Richard Rorty, ethnocentrism is the suggestion that there is an acculturated historical communal word view around which we have consilience in a specific community, and beyond which there is little sense in asking for justification of that world view, e.g. in “Solidarity or Objectivity.” Post-Analytic Philosophy 3 (1985): 5-6. Print. Susan S. Silbey. “Ideology, Power, and Justice.” Justice and Power in Sociolegal Studies. Eds. Bryant G. Garth and Austin Sarat. Evanston, IL: Northwestern University Press / The American Bar Foundation, 1998. 276. Print. Ludwig Wittgenstein. Philosophical Investigations. 4th ed. Trans. Hacker and Schulte. Wiley-Blackwell, 2009. Print. Chantal Mouffe. The Democratic Paradox. London: Verso, 2000. Print. See the discussion in Linda Zerilli. Feminism and the Abyss of Freedom. Chicago: University of Chicago Press, 2005. Print. Robert Brandom. Making It Explicit: Reasoning, Representing, and Discursive Commitment. Cambridge, MA: Harvard University Press, 1994. 44. Print. Robert Brandom. Between Saying and Doing: Towards an Analytic Pragmatism. Oxford: Oxford University Press, 2008. Print. Jürgen Habermas. “From Kant to Hegel: On Robert Brandom’s Pragmatic Philosophy of Language.” European Journal of Philosophy 8-3 (2000): 322–355. 345. Print. A similar point is made in Timothy Williamson. The Philosophy of Philosophy. Malden, MA: Blackwell, 2007. Print. The account here effectively takes the interactional dynamics of syntax detailed above to embellish and expand upon the cybernetic, calibrational, and action-coordination, additions to Brandom’s account discussed in Austin Hill and Jonathan Rubin. “The Genealogy of Normativity.” Pli: Warwick Journal of Philosophy 11 (2001): 122-70. Print; Matthias Kiesselbach. “Constructing Commitment: Brandom’s Pragmatist Take on Rule-Following.” Philosophical Investigations 35-2 (2012): 101-26. Print; Kevin Scharp. “Communication and Content: Circumstances and Consequences of the Habermas-Brandom Debate.” International Journal of Philosophical Studies 11-1 (2001): 43-61. Print, respectively, and developed in full in James Trafford. Reason and Power: Reforging the Social World. Forthcoming. Eleni Gregoromichelaki and Ruth Kempson. “Grammars as Processes for Interactive Language Use: Incrementality and the Emergence of Joint Intentionality.” Perspectives on Linguistic Pragmatics. Springer Press, 2013. 185-216. Print. This view coheres with “interactivism,” “enactivism,” and “interaction theory,” in which cognitive activity (including the construction of meaning) is inextricable from an agents’ environment, both social and physical, e.g. Shaun Gallagher and Katsunori Miyahara. “Neo-Pragmatism and Enactive Intentionality.” New Directions in Philosophy and Cognitive Science: Adaptation and Cephalic Expression. Ed. Jay Schulkin. Palgrave Macmillan, 2012. Print. Gregoromichelaki et. al. Op cit. 209. Pezzulo discusses (often sub-personal) “coordination tools” which explain the ease by which interactions occur. Giovanni Pezzulo. “Shared Representations as Coordination Tools for Interaction.” Review of Philosophy and Psychology 2-2 (2011): 303-333. Print. See Simon Garrod and Anthony Anderson. “Saying What You Mean in Dialogue: A Study in Conceptual and Semantic Co-Ordination.” Cognition 27-2 (1987): 181-218. Print. Wilfrid Sellars. “Some Reflections on Language Games”. Philosophy of Science 21-3 (1954): 204-28. Print. For an attempt to formally account for some of these dynamics, see James Trafford. Meaning in Dialogue: An Interactive Approach to Logic and Reasoning. Springer Press, 2016. Print. Herbert H. Clark. Using Language. Cambridge: Cambridge University Press, 1996. Print. See, for example, the analysis of power and control in conversational repair as including mechanisms of silencing, interruption, control of access to common ground, in Emanuel A. Schegloff, Gail Jefferson, and Harvey Sacks. “The Preference for Self-Correction in the Organization of Repair in Conversation.” Language (1997): 361-382. Print. See Gregoromichelaki et al. Op. cit. 2013 for a similar analysis of group tasks. Attempts to extricate rational norms rely upon an individualist account of reason in which our reasoning can be judged by external standards in a social vacuum, which is argued against in detail in Brandom. Op cit. 1994; Anthony Simon Laden. Reasoning: A Social Picture. Oxford: Oxford University Press, 2012. Print. Michel Foucault. “The Subject and Power.” Critical Inquiry 8-4 (1982): 777-795. Print. Hall similarly suggests that “hegemony is always the temporary mastery of a particular theater of struggle. It marks a shift in the dispositions of contending forces in a field of struggle and the articulation of that field into a tendency.” S. Hall, D. Hobson, A. Lowe, and P. Willis. Culture, Media, Language: Working Papers in Cultural Studies, 1972-79. Taylor & Francis, 2003. 36. Print. See Ian Hacking. The Social Construction of What? Cambridge, MA: Harvard University Press, 1999. Print. Eleni Gregoromichelaki, Ronnie Cann, and Ruth Kempson. “On Co-Ordination in Dialogue: Sub-Sentential Talk and Its Implications.” Brevity. Ed. Laurence Goldstein. Oxford: Oxford University Press, 2013. 53-73. Print. See the discussion of “we-reasons” in Laden. Op cit. 2012. Anthony Giddens. Central Problems in Social Theory: Action, Structure, and Contradiction in Social Analysis. Berkeley, CA: University of California Press, 1979. 195. Print. The term re-engineering is drawn from Wimsatt, who defines it as the process of “…taking, modifying, and reassessing what is at hand, and employing it in new contexts, thus re-engineering. Re-engineering is cumulative and is what makes our cumulative cultures possible.” William Wimsatt. Re-Engineering Philosophy for Limited Beings: Piecewise Approximations to Reality. Cambridge, MA: Harvard University Press, 2007. 6. Print. Whilst much has been said regarding the political impotence of artistic practice, and its complicity with financialisation (though see the discussion in Robin Mackay, Luke Pendrell, and James Trafford. Speculative Aesthetics. Falmouth: Urbanomic, 2014. Print. ), it should be clear that art, understood in the context of this process of re-engineering is capable of a torsion in which the politics of appearance is shown to be inextricable from its underlying structural reconfiguration. Such appearances may thereby be unhinged from their natural status without invoking voluntarism, and their inevitability unbound from within the same structural processes of power in which the artist is implicated. Foucault. Op. cit. 786-7. When habitually sedimented norms begin to shift, these may be experienced as abrasive “triggers” from the point of view of those who are positionally privileged by those norms. People may claim that certain interactions are unreasonable, whilst those interactions are directed at shifting structural norms such that social positions and actions may be transformed to attend to structural imbalances of power. It is precisely in these moments of problematic interruption to harmonious interaction that it becomes possible to orient ourselves towards the contingency of our local meanings, so making visible our latent parochialisms and “reasonable” biases. For analysis of this in terms of “white fragility.” See Robin DiAngelo. “White Fragility.” The International Journal of Critical Pedagogy 3-3 (2011). Print. James Trafford is Senior Lecturer in Critical Approaches to Art & Design at the University for the Creative Arts, Epsom UK.